We have a strong following for William Mellor Paintings. If you are considering selling any painting, please get in touch for a free appraisal. Click the button to complete our short form, and our Paintings expert Stephen Sparrow will be in touch. Born in 1851 in Barnsley, Yorkshire, the painter William Mellor specialised in landscapes and in particular in local scenes around Ilkley, Scarborough and Harrogate, all of which he lived in at various points of his life. Not much is known about his early life, other than the fact that he seems never to have exhibited his paintings in London. However, we know Mellor travelled widely around the UK, painting the landscapes of the Lake District and North Wales - typical views are Bolton Abbey, Grasmere or Ullswater. For practical reasons, most of William’s work was painted in the summer or early autumn as the majority of it was executed on location. He was an excellent observer and his work contains a wealth of detail as well as impressive technical composition. Mellor died in 1931. Mellor was one of a number of 19th century landscape artists who documented the unspoiled landscape of England and like a number of his contemporaries he was very skilled at depicting the effects of light, giving his paintings a feeling of peace and space. Mellor's son, Everett Watson Mellor, was also a landscape artist who painted similar subjects to his father. William Mellor’s work is very sought after at auction, of interest to collectors both as a documentation of a simpler historical period and for its technical accomplishment. He was a skilled observer who paid great attention to detail, and among his most popular paintings are those that depict a meticulous rendering of foliage dappled with sunlight. As with all artwork, the value of William Mellor’s work varies a little according to the size and subject matter. At Peter Wilson’s our in-house expert Stephen Sparrow has years of experience in assessing and valuing William Mellor’s paintings, so do get in touch if you’d like to learn more about a piece you own, or discuss a potential sale or valuation. On the right of this page you will see a few highlights of William Mellor paintings we've sold - to see more, including prices and dates, search our sold lot archives. William Mellor, On The Wharfe, Bolton Woods, Yorkshire, oil. William Mellor, River scene, oil on canvas. 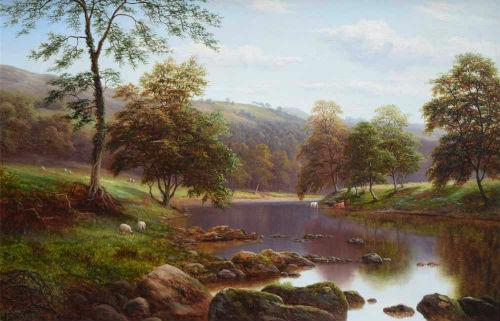 William Mellor, On the Wharfe, Yorkshire, oil.